Most peoples' impression of what the Texas landscape looks like comes from California. Think about it. Most people get their ideas of Texas from television and the movies, from Westerns set in Texas and filmed in California. So most people tend to think of Texas as, well, dirt. Desert. And there is desert in Texas. Just not the whole of the state. It's a big place, remember. The movie Happy, Texas was filmed in California. I have not actually driven down the main street in Happy--yes, there is a town in Texas named Happy--but I have driven within a mile of it. Happy is in the Texas Panhandle, about 15 miles from the city of Canyon, which is about 30 miles south of Amarillo. In the movie, there are orange groves and picturesque mountains surrounding the California setting. One of the times I drove by Happy, there was a blizzard howling and I was driving very slowly to get through the blowing snowfall without running off the road. Orange trees would freeze to death. So. According to the little map I put up above, there are seven main regions in Texas. In this blog, I'm going to try to give a bit of an overview--orient the Big Six cities in the regions where they belong, hopefully without going off on too many tangents. 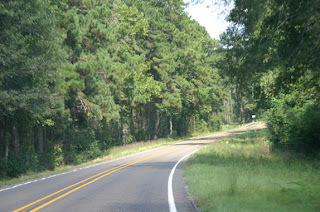 The East Texas Piney Woods also includes the Big Thicket. This is an area where the growth under the trees is so dense, you pretty much need a machete to get through it. Not exactly desert. You do not cross the Sabine River between Louisiana and Texas and automatically run into desert. The terrain in East Texas is pretty much the same as you get in Louisiana. Swamps in the south near the coast, pine tree forest north of that. As you drive from Houston to Dallas, you will gradually leave the Piney Woods behind for the "Prairies and Lakes" region. Houston is big enough, it runs from the Coastal Plain into the Piney Woods. (And yes, it is always called "Piney" which rhymes with whiny. Deal.) The Memorial section of Houston is definitely in the Piney Woods. South Houston is definitely coastal. Dallas and Fort Worth are both in the "Prairies and Lakes" region. I am using quotation marks because there is only one (maybe) natural lake in the state of Texas. Every single lake, except maybe Caddo Lake in East Texas, is man-made from a dammed-up river, and I'm not absolutely positive about Caddo. The traditional name for this region is Cross-timber Prairie or the Crosstimbers, because it's prairie--rolling hills that are mostly meadow--but those meadows are crossed with big stands of timber. Trees. In bands that probably correspond with underground water. These trees are not pines, for the most part. 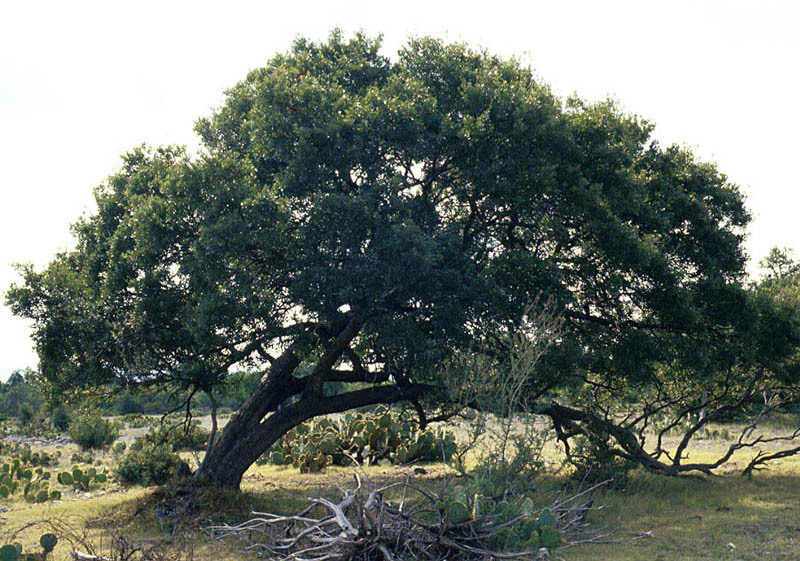 They are primarily oaks with hackberry, elm, juniper and other trees mixed in. Except for the Lost Pines region in Bastrop County, just outside of Austin, pine trees do not readily grow anywhere in Texas outside of the Piney Woods. So you really can't have a "Pine Ridge" anywhere in West Texas. Just sayin'. I'll try to remember to say a little more about Lost Pines when I'm talking more about the flora of Texas. Austin is at the edge of the Hill Country. The Hill Country (which is different from Hill County, just north of Waco and smack in the middle of the blackland prairie) was formed millennia ago from the Balcones Escarpment and the Edwards Plateau. But don't ask me how. I just know that the rocks are mostly limestone, the trees are almost exclusively live oak, mesquite and juniper with some cedar elm thrown in, and there are hills. Really beautiful hills. It's dry, but there are a lot of springs. You get some beautiful views from the tops of some of those hills. San Antonio has traditionally been considered the gateway to South Texas. 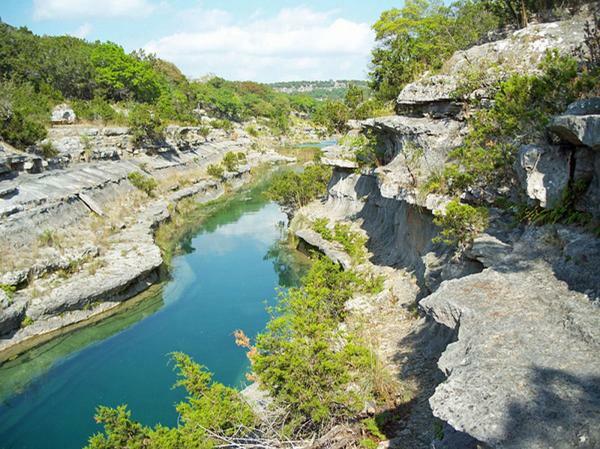 It's just past the edge of the Hill Country--it's closer to Fredericksburg, Kerrville and Boerne (pronounced Burney) (three of the main Hill Country towns) than Austin is--at the top of the South Texas Plains. The only trees I remember seeing in that area are mesquites. Nothing tall. Probably yaupon holly, which will grow about as tall as a mesquite. Maybe some juniper. And cottonwoods along the rivers. "Alamo" is Spanish for "cottonwood." El Paso is part of the Big Bend Country. The Big Bend is where you get actual desert, real mountains and some more canyons. 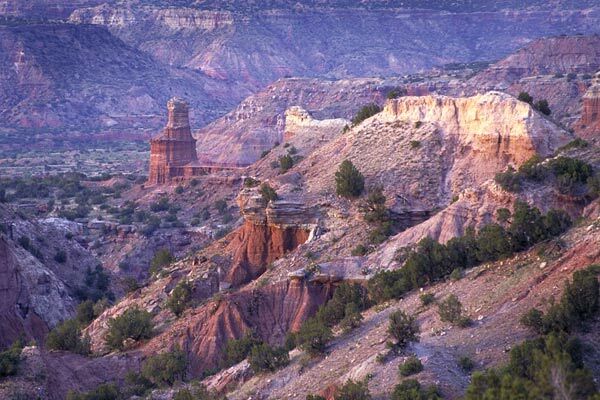 The Palo Duro, in the Panhandle, is the biggest canyon in the state. In fact, it's the second biggest in the country. But there are some nice canyons along the Rio Grande. Mesquites still grow, but they look more like shrubs in this part of the country. Giant yucca are the bigger "trees." There are no huge cities in either the Panhandle Plains or the Piney Woods. Well, Houston is sort of in the Piney Woods. It's just at the very southern edge of it... Lubbock, Amarillo, Abilene, and Wichita Falls are the biggest cities in the Panhandle Plains region, all over 100,000 population, and San Angelo comes close. In the Piney Woods, Tyler and Longview are each just under 100,000, and they're close enough to each other that they share their metropolitan area. But all the other cities are smaller. Plenty of small towns for authors to write about small-town Texas. It's just that--for writers, East Texas isn't very "Texas-y." Too many trees, not enough cows. Stay tuned. More tangents ahead. In this blog post, we're going to talk about distance. There's a lot of it in Texas, but there may not be as much as some of you think. In Texas, distance is--and is not--relative. For instance, when the fella and I lived up in the Texas Panhandle, we thought nothing whatsoever of hopping into the car and driving 60 miles--one hour--into Amarillo just to go out to dinner. No big deal. I drove into Amarillo once a week to go to art classes. We'd drive an hour and a half to Quanah to watch our son's marching band at the football game. We didn't drive up to Canadian, 2-1/2 hours north of Clarendon. That was a little too far. But the kids went. So, it depends on what part of Texas you're in as to how far "far" is. In West Texas, 60 miles is not nearly as far as it is in the eastern part of the state. But--it's still 60 miles. Which brings me to my next point. Yes, Texas is big, but it's not that big. You cannot set a small town at four hours from Amarillo and still be in Texas. Well, unless you wind up down past Lubbock (only 2 hours' drive south) or somewhere past Abilene. Or beyond Wichita Falls, almost to Fort Worth. You can get to Oklahoma City from Amarillo in four hours. You can get to the Red River ski basin in New Mexico from Amarillo in four hours. The friend from Ohio who consulted me about the distances in her Texas-set book did it before her book got published, so she was able to cut her distance down to 2 hours. That's doable. Dalhart and Canadian are both about 2 to 2-1/2 hours away. I recently read a published book in which the small town was six hours drive from Austin. The book made it sound like Austin was the nearest big city to this little town. Problem is, that just isn't going to happen. Six hours north from Austin, you will have driven all the way through Dallas or Fort Worth and be on the Oklahoma border. Six hours east, and you'll be completely through Houston, past Beaumont and well into Louisiana (probably close to Lake Charles). Six hours west will take you into Midland, which is a large city of over 100,000, especially now with the oil/shale gas boom. Six hours south, and you will be in Mexico. Laredo is just less than four hours from Austin. If you angle off southeast and go toward Brownsville, you'll be in Brownsville, which is a large city in itself. If you angle to the northwest from Austin, six hours will take you past Abilene almost to Childress, Texas--which is the closest town to where Texas & Oklahoma take the turn for the Texas Panhandle. Out there, the closest big city will be Abilene or Wichita Falls. (Both close to 200,000 pop.) This is one of the reasons they made Austin the state capital. Because it's not too terribly far from anywhere in Texas. Except the El Paso/trans-Pecos area, and the Panhandle. When I used to drive from Clarendon--which is in the southeastern part of the Panhandle, nearer the rest of the state (close to the bottom of the I-40 shield in the image)--to visit my parents in Austin, it would take me about 10 hours, whether I went through Fort Worth or bypassed the big cities. From Clarendon, we could get to Denver, Oklahoma City, Santa Fe, Little Rock and even Topeka, Kansas--the capital cities of their respective states--quicker than we could get to the capital of our own state. However, in Texas, you are never more than a couple hours' drive from a large city (unless you're in the Big Bend). Depends on which one. You can look up how far it is from one city to another--even small towns. If you don't know how long it takes to drive 350 miles, Google Maps will tell you. You can pop up to Dallas for the day from Austin--but you won't have a whole lot of time to do much of anything, and you'll probably be driving back in the dark, because it's four hours' drive from Austin to Dallas. And four hours' drive back. You can't send somebody driving from Houston to South Padre Island, have your character take a nap while somebody else drives, and have them wake up and be there. It takes just over six hours to drive that distance--372 miles. You're gonna have to make at least one pit stop. Probably near Corpus Christi--one of those good-sized cities. Distance may be relative--but it still takes the time to do the driving. Look at the map. See what else is out there. Otherwise, those of us who actually live in Texas will be rolling our eyes at your story. I've been thinking about this for a long time and finally, I'm doing something about it. Texas is an interesting place--mythical, in some ways. And yes, Texans often believe in their own myths, and even make them up as they go along. But some things--like geography--aren't mythical. Nor are they common knowledge. They're the kinds of things people might not realize if they haven't actually spent a lot of time in Texas. So, I'm going to try to write a series of articles about things in Texas that writers need to know. Some of those things are going to relate to mistakes I've read in books. Some of them might not relate to things specifically Texan, but more to generic small towns. A lot of them are going to relate to Texas geography. This will have relevance for those who write historical fiction set in Texas, as well as contemporary novels. Other posts will have to do with how things are run today in Texas, from politics to schools (which is pretty much more politics). Just who do I think I am, you might be asking, to think I have the right to be writing these articles? It is true that I was not born in Texas. But my parents are both native Texans--my dad born in San Antonio and my mother in Crystal City (spinach capital of the US, complete with a statue of Popeye)--and my dad was in the Air Force when I was born, serving out his commitment to the country for helping him get his degree at Baylor University in Waco, Texas. I was a year old when we came back to Texas, and have lived here most of the time since. More importantly, I've lived in Texas all of my adult life. I graduated from Baylor myself, where I met and married my fella, and we've been in Texas ever since. Most of our relatives live in various parts of Texas (I have a sister who lives in Idaho, but she's the only weird one--oh, and the daughter in Georgia. But that's all, till you get to cousins and nephews, and really, do they count? (Well, yes, but even then, there's not many out of state.)). We raised our kids in Texas. The fella and I both attended 5A high schools in Arlington and Houston, respectively, and our children attended 3A and 1A schools. (More about the "As" in a later post.) The only part of Texas I haven't traveled to visit relatives is El Paso. Which is really more like New Mexico, and I've been there--though mostly in the northern parts. Believe me, I know Texas. So I'm going to do my best to assist all those writers out there who may not be quite so familiar with it. I'm going to start with basic geography and move from there into schools and government, but if you have a question about a particular thing, ask and I'll put up a blog about it. And I'm going to finish up this blog with a little basic geography. First, Texas is big. Yes, it's a cliche, but it's one of those things that are cliches because it's true. The thing is, there are a lot of big cities in Texas. There is no other state in the USA with as many cities as large as those in Texas--I'm talking 500,000-plus in the Metropolitan Statistical Area (city & suburbs)--and most Texans live in those large cities. Update: According to the February 2013 issue of Texas Monthly, the order in size of the Big Six is: Houston (2,145,933+), San Antonio (1,359,730+), Dallas (1,223,478+), Austin (820,601+), Fort Worth (780,758+), and El Paso (665,577+). The February issue was all about the big cities. Hmm. Even added together, Dallas and Fort Worth (which are 30 miles apart) do not equal Houston's population. And really, the cities are so different, you can't count them together. It would be as wrong as considering Minneapolis and St. Paul the same city. Only more so. End of Update. Update again: According to the fella--and I checked, so he's right--those numbers speak to the population within the city limits alone. The metro areas of those cities are much larger. Just so you know... End of new update. After the Big Six, there are a lot of cities in the 200,000 population range. That's as big as Pittsburgh, PA or Buffalo, NY. Those cities include Waco, Corpus Christi, Amarillo (Yes. ), Lubbock, Wichita Falls, Midland and Odessa if you count them together, and maybe Beaumont, Laredo and Abilene. It's pretty hard to get anyplace in Texas without being reasonably close to a good-sized city. And, if you'll take a gander at that top image, you might notice all those "regions" of Texas. They're pretty different from each other. I've lived in three of them and had relatives living in all the rest. Just think about that for a while, and I'll get back with another post about distance and geography by next Monday, if not before. Remember, if you have questions, ask, and I'll do my best to answer them. I'll even look stuff up to have the exact answer and not just pop off from the top of my head.